We had two weeks in a row of beach-themed activities. 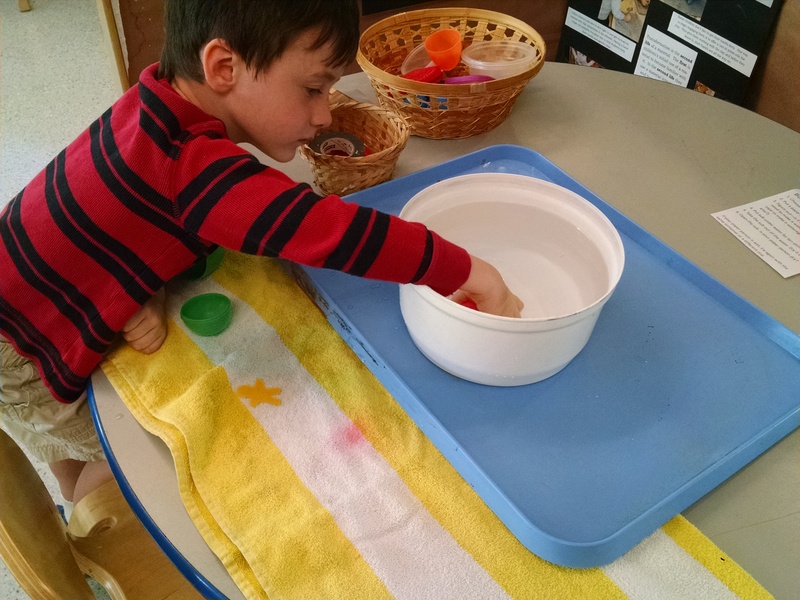 The first was Sink and Float, which included discussion about boats, and some activities with seashells that might wash up on a beach. 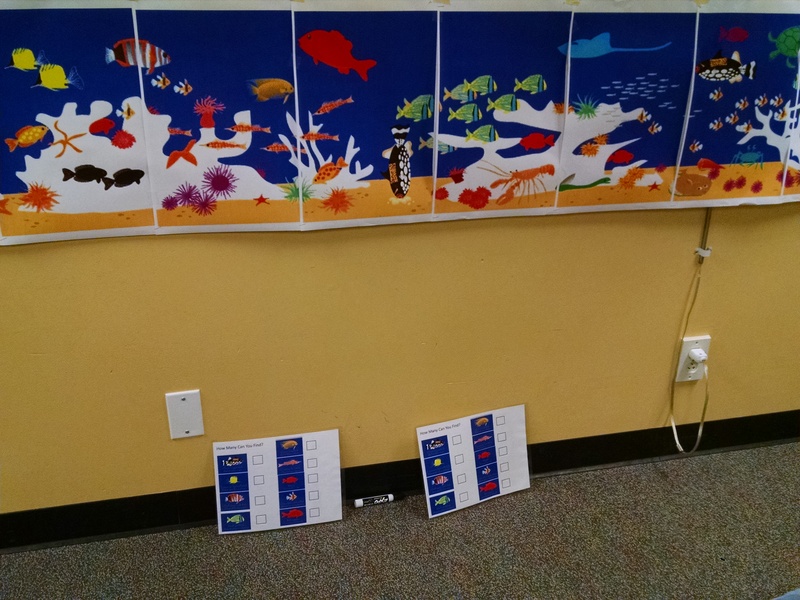 This week, we went “Under the Sea” and talked some about coral reefs, fish, scuba divers, and submarines. Each week, at our STEM enrichment class, we issue one or more “challenges” – a “can you build it” test. 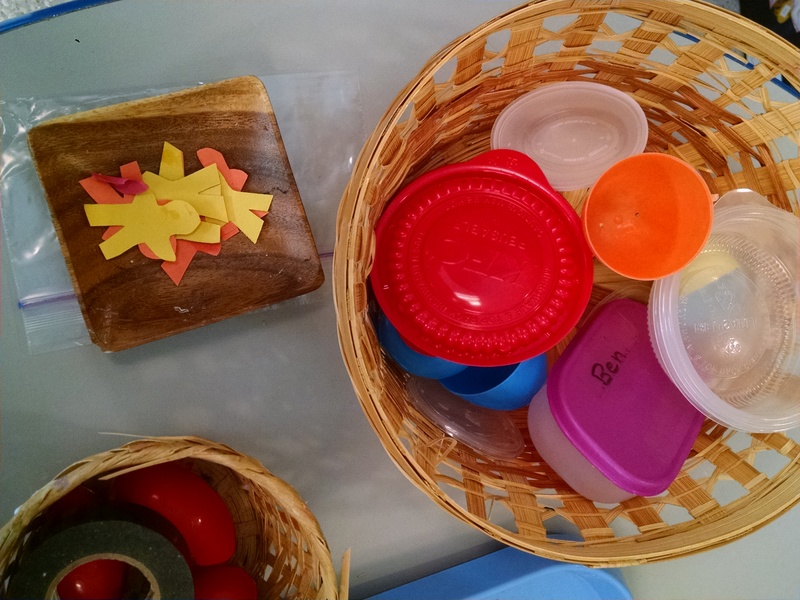 We put out a variety of materials and kids try to create something that works. It usually involves lots of tinkering and trial and error. You build a sample, test it, adjust, test it again, and adjust again. 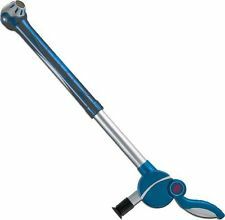 I always test these at home in advance so I know it’s do-able, but sometimes, like this week, getting one to work takes a lot of repetition and patience. In our morning class, I worked on a diver bottle with an almost-five year old for 15 minutes, then handed off to a dad who worked with that boy for another ten minutes to get a working prototype to show in opening circle. I was so proud of this boy for how long he stuck with this project and how well he worked with two adults who were not-his-dad. This is big progress since the start of the year for this child. We were so excited when we got the diver to work! Diver Bottles. I will cover the basic details here. There are lots more details in this post. Build your diver: Cut a straw into short lengths. Take a bit of Silly Putty to cover/seal one end so air can’t escape. Put a paper clip on the other end to weigh it down. Now, set this in a cup of water to see if it floats. 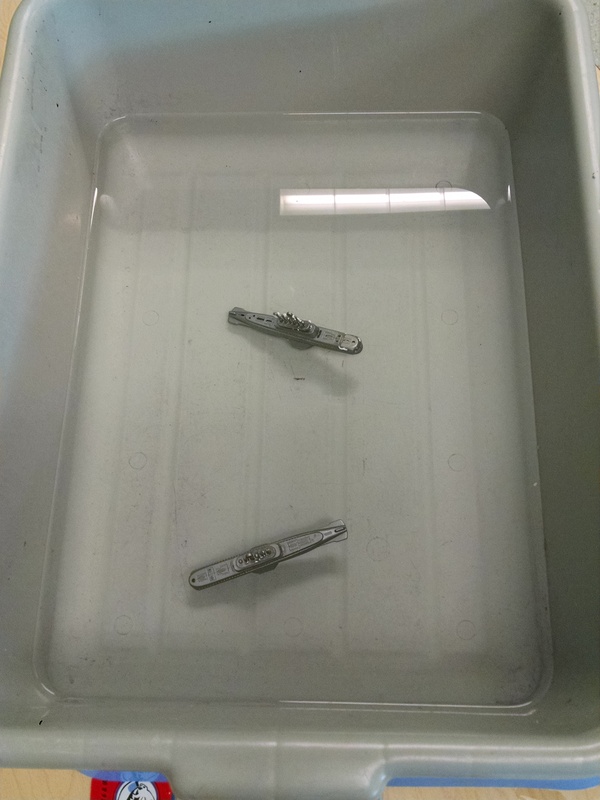 If it sinks, use a smaller paper clip or less putty (less weight) or longer straw (traps more air, making it more buoyant). If it floats too high and tips on its side, then use a bigger paper clip or shorter straw. Keep adjusting till the straw stays upright in the water, just barely floating. We cut small people shapes from construction paper. I told the children that the person wanted to go under water in a sub and not get wet. I picked a Tupperware container I knew was watertight. We put the person inside, sealed it and held it under water and counted to ten. We took it out, dried it off the outside, then opened it and ta-da – there’s a dry paper person inside. But then I took a plastic Easter egg, and said “let’s test this without a person yet.” We held the egg under the water, and immediately a stream of bubbles came up. I said “uh-oh, what does that mean?” They knew air was escaping because of experiments we did in the States of Matter week. I showed them the holes in the egg, then I said… “if water is going out, what’s going in?” Then I lifted it up out of the water, and the water poured out through the hole. Phew – thank goodness this was an unmanned test. So, then we figured out together how to plug the holes. (I made it easy, because the only useable hole-filler on the table was Silly Putty, which I knew would do the job. If you wanted to, you could also offer tape or glue or other substances to plug the holes and encourage them to test them all.) We plugged the holes, put a little paper person in. Sealed the egg and held it under the water for ten seconds. Results – it “almost worked”. (This phrase is a reference to the book we read – Papa’s Mechanical Fish.) The paper person may be dry, or just damp on one edge, but there will be a little standing water in the egg. We work out the idea that the water is getting in through the seam between the two halves of the egg. We cover the seam with a ring of silly putty to seal it. Success! Dry paper people! 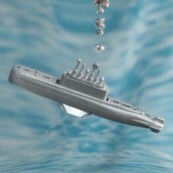 This experiment relates to how submarines work. When they want to dive, they fill ballast tanks with water to increase their density and sink. When they want to re-surface, they pump compressed air into the tanks, which forces the water out. Since air is less dense than water, the sub rises. 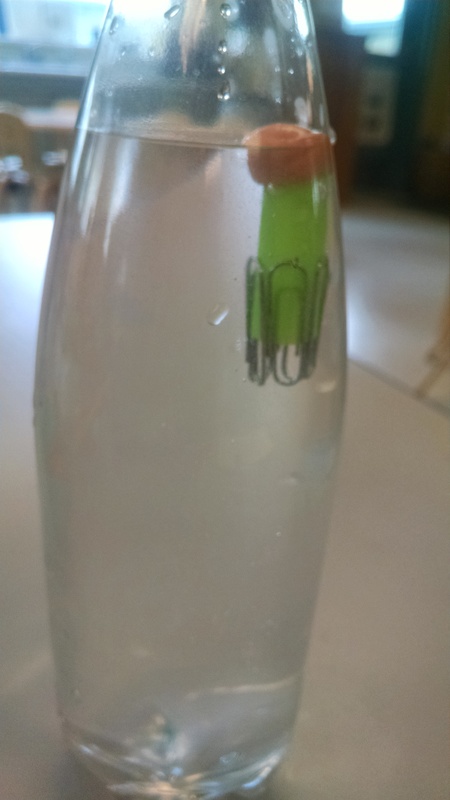 This experiment is not a perfect re-creation of that… since they’re not watertight… the water bottle has big holes in the side, the second you stop blowing on the straw, the water rushes back in and the sub sinks. Note: baking soda will not react with water (though it would react if you put it in a container of vinegar.) The baking powder contains both baking soda (sodium bicarbonate) which is a base and cream of tartar, an acid. When the water reaches the powder, it activates the reaction. It’s a cool little experiment, but a couple caveats… the chamber for the baking powder is small – it’s hard to fill it using a spoon or funnel. I had good luck using a pipette at home, but it didn’t work as well at class. This is also slow… you have to wait probably 60 – 90 seconds before anything happens (the sub rising or sinking). This worked out fine for my five year old’s attention span when he was home eating a snack and watching it. It was harder in the class setting for kids to stand and pay attention long enough. And often they would wait 60 seconds, then turn away for one second and turn back, and discover it floated to the top when they weren’t looking. From now on, rather than using it as a classroom station, we’ll do it at the snack table for low key entertainment. If you don’t want to buy the toy, you could try making one…. Tool of the Week – the Periscope. 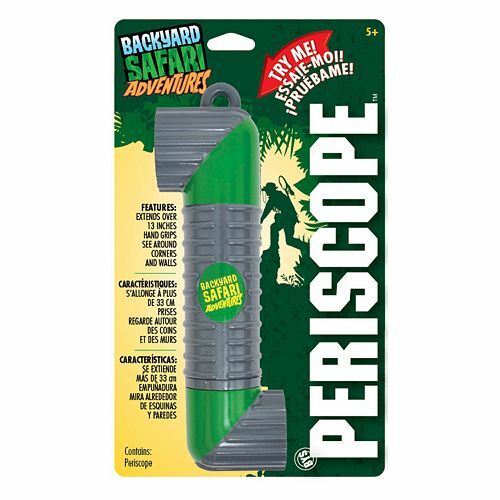 I purchased two: the Backyard Safari Periscope and the Elenco Adjustable Periscope. The Elenco is much cooler because it’s much bigger, but the Backyard is more manageable for the three to five year old’s motor skills. 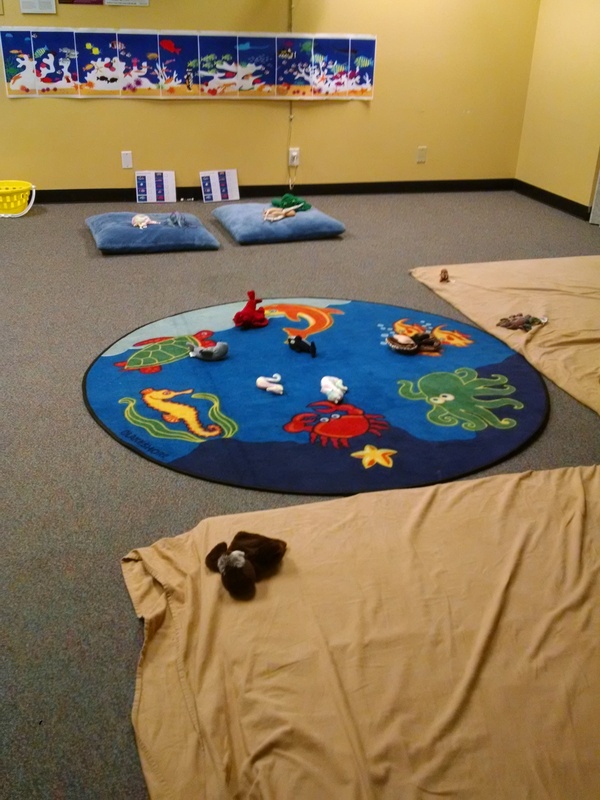 See “circle time” below for how I introduced these. 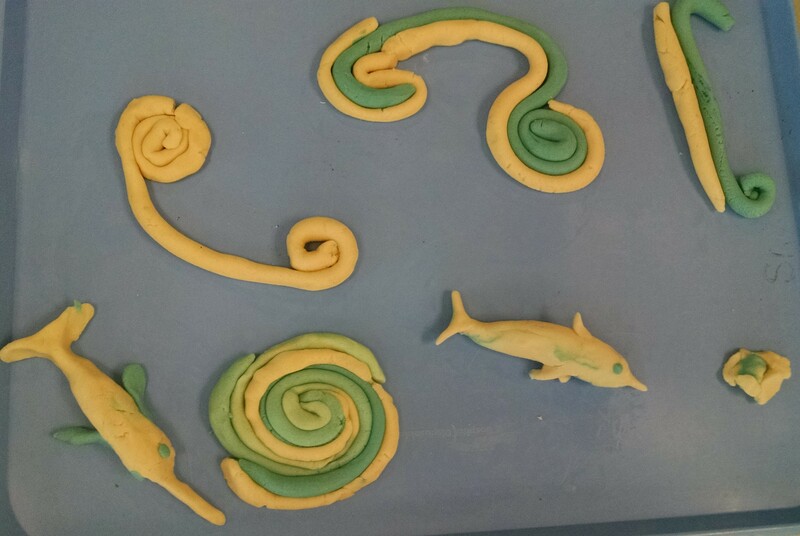 Playdough Sculpting. 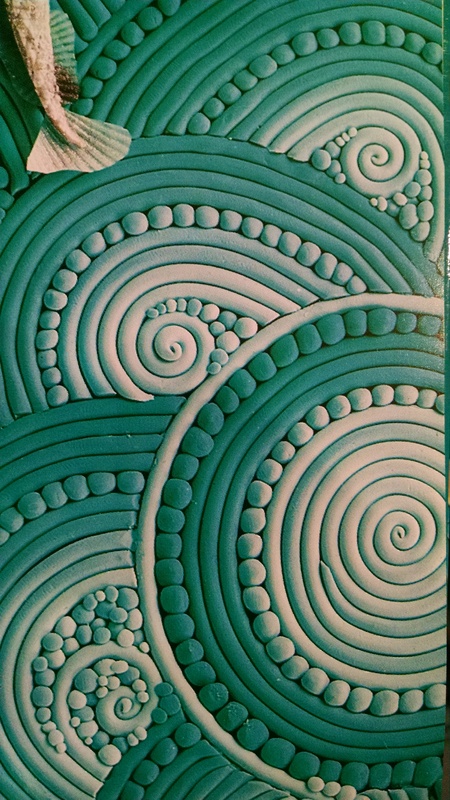 The illustrations in the book Over in the Ocean are photographs of amazing Sculpy art by Jeanette Canyon. 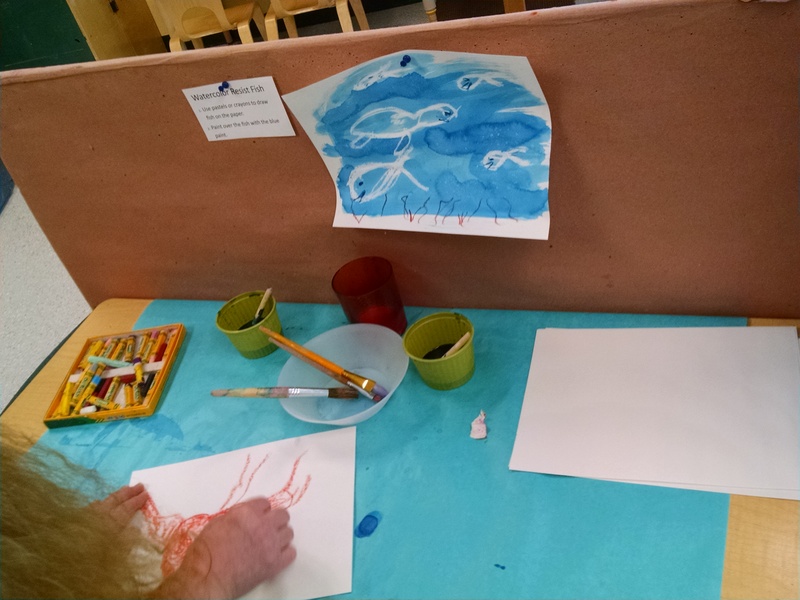 We put the book, samples of the art, white play-dough and blue play-dough on the table and encouraged the children (and parents) to try to recreate Canyon’s style. Fingerprint Fish. 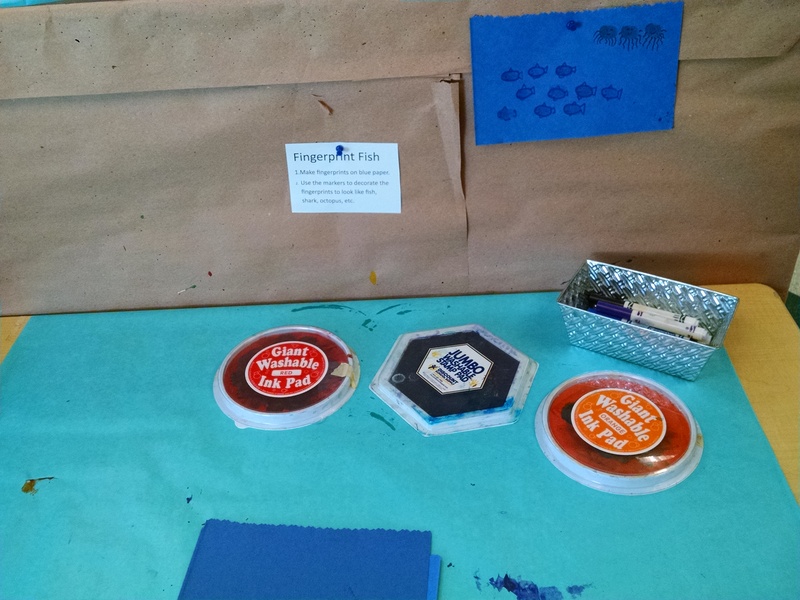 I put out blue paper, ink pads for rubber stamps, and markers. 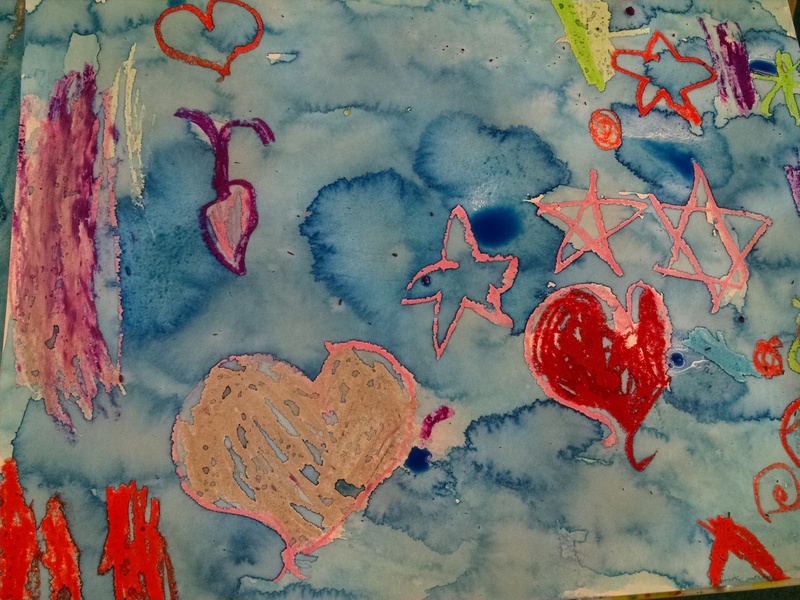 Kids could make fingerprints, then turn them into fish by decorating with markers. I used a picture from https://www.etsy.com/listing/13261893/underwater-card as inspiration. Paint Waves. Add fish. At the easel, we had blue, green, and blue glitter paint. We encouraged kids to paint water. Then we had paper fish cut out and jewels to glue on to make a sea scape. Fish match and sort. I made cards with pictures of fish / sea life on them. 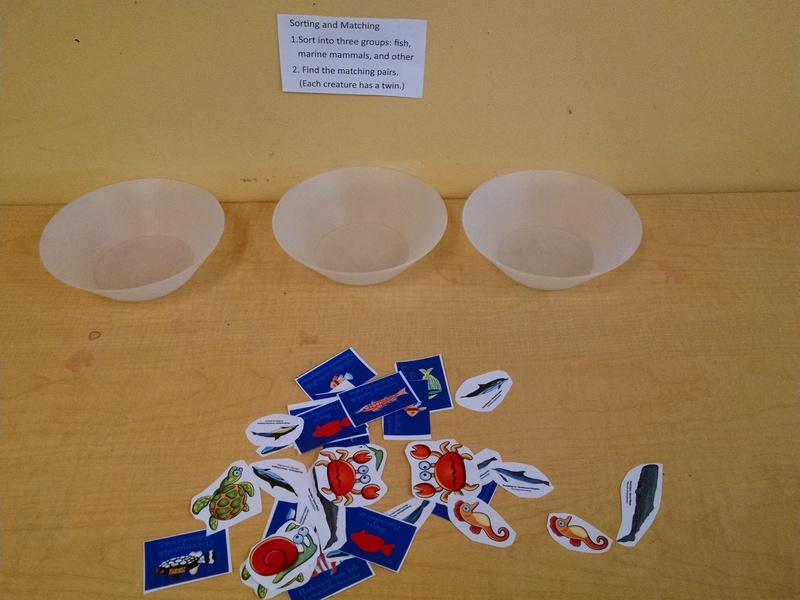 (Two of each) Kids can sort into categories, or find the matching fish. 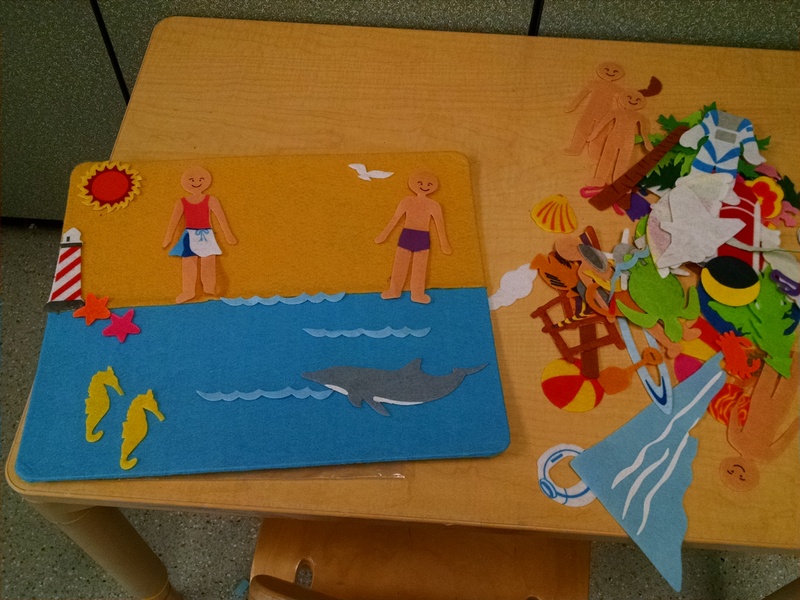 Puzzles and Manipulatives: We used sea life related items from class supplies. 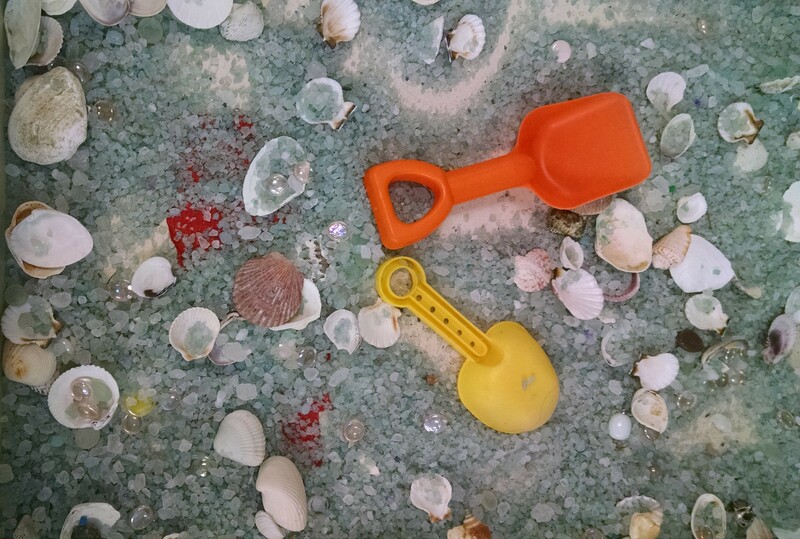 Sensory Table Ideas: We could have done sand with shells mixed in, but we’d done that the previous week, so we used rock salt and mixed in shells. 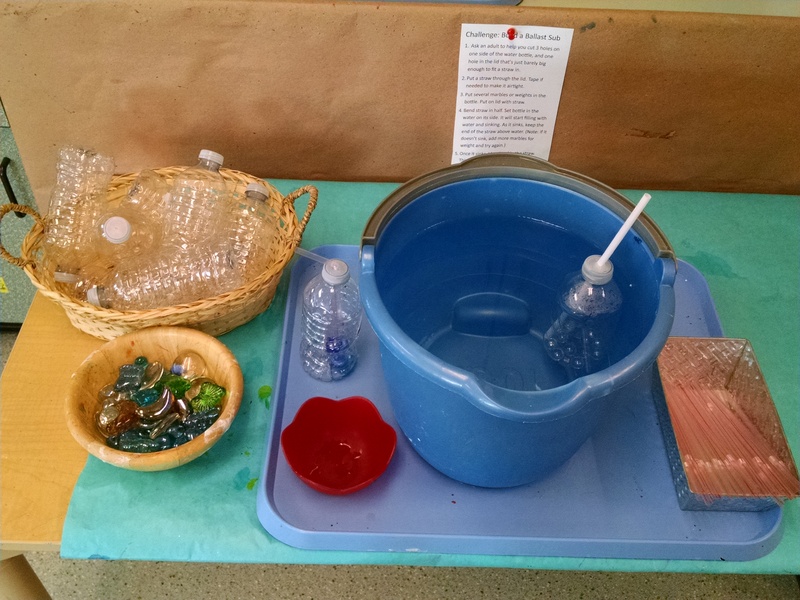 Water Table: We filled it with plastic fish, fish nets. Game: Somethin’ Fishy was a card game from Simply Fun. I can’t find it on their website, so it may be out of print, which is a shame, because it’s a great game for 4 – 6 year olds. 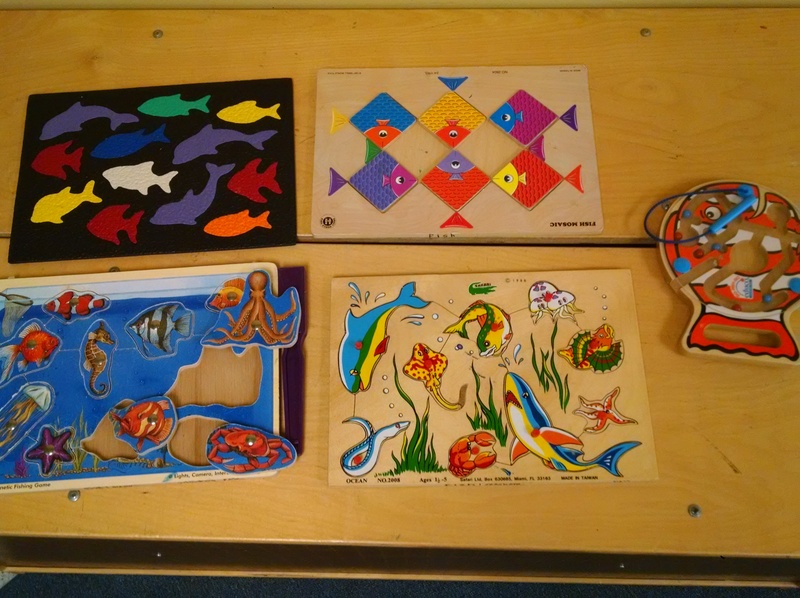 You could make your own… here’s how it works: The cards have a picture of a fish on them. There are four species of fish. In each species there are big fish, little fish, and hungry fish. You draw a card and start a line of fish in front of you. Then draw again. 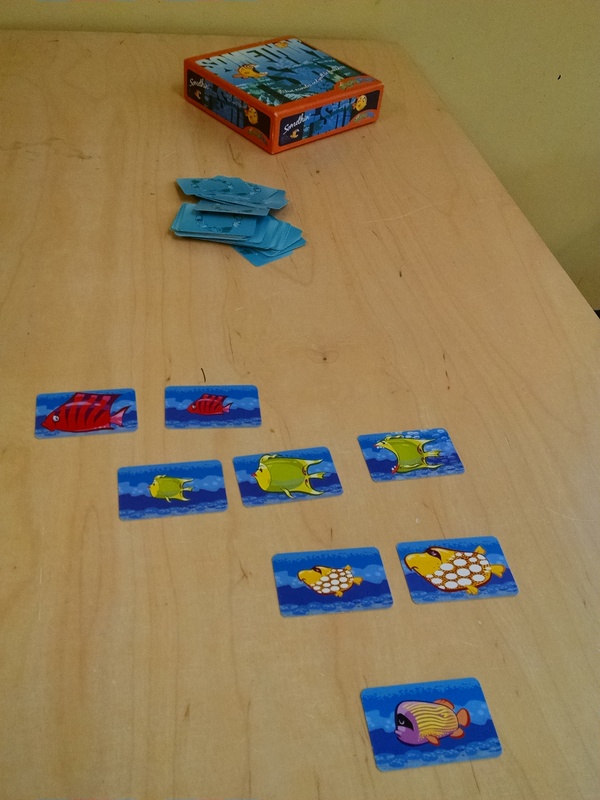 If that card matches the last fish in your line (same color or size) you add it to the line and you continue your turn or, if you have more than three cards in your line, you can choose to collect your cards (i.e. pick up all the cards in your line, set them aside to score later.) If it’s a different color or size, hand it to the person on your left and your turn ends. If it’s a hungry fish… if it is the same species as the last fish in your line, your turn ends, but otherwise you’re safe. Hungry fish don’t eat their own species. But, if it’s a different species than the end of your line, it eats all the fish in your line till it gets to one of its own species. Your turn ends. At the end of the game, you count cards in your score pile. Outside Play – Beachcombing: Print paper seashells and items to find on a beach. (I used these: www.first-school.ws/t/apshellsc.htm.) Scatter them outside in sand play area. If all your students were 6 or 7, you could probably just teach this as it is. But our kids range in age from barely 3 to almost 8, so here’s how we did it: First, two adults demo it. Then pair up one grown-up with each kid. Level one – the child puts their hands up in front of them palms out and just holds them there. The adult claps against their upheld hands. If they master that, then on to level two – the adult holds their hands still and the kid claps against them. Then for those who can – on to level three, where both clap simultaneously. Level 4 – speed that up! This game teaches rhythm, hand-eye coordination, singing and moving at the same time, and teamwork. When you’re in a submarine under the water, what can you use to look under the water (demo a “porthole” using a plastic hoop). What could you use to look at what’s up above the water? Periscopes. I talked about how periscopes are used on submarines. Then I told them they could also be used on land to spy on things. I hid behind a piece of furniture and asked “Can you see me?” No. “Can I see you? Nope…. all I see is the back of this bookcase. Oh wait, I brought my periscope. Now I see you! I see ____ and I see ____. Hey, Teacher Cym hold up 1 – 5 fingers so I can prove I see you… you’re holding up 3!” The kids LOVED it, so we then left them to play with those after circle. Book: The Fantastic Undersea Life of Jacques Cousteau. Music: Hand out shakers, or scarves, or sea life puppets and dance to Under the Sea from Little Mermaid or Yellow Submarine by the Beatles. Papa’s Mechanical Fish by Fleming and Kulikov. On my list of Most Recommended Books about Inventors. What I like about it: nice story about a family – Papa, Mama, four kids, and a dog Rex. Papa is an inventor who has invented many (entertaining) things that “almost work.” Then on a family fishing trip he has a Eureka moment – he wants to build mechanical fish he can ride underwater in. He attempts. And fails. Then makes a bigger bolder attempt. And fails. But he keeps trying, and in the end creates a sub that seats 7 in velvet upholstered chairs and the family has a delightful day under the water. Appeals to a broad age range, 4 – 8, with lots of giggling over the misadventures of Papa. It’s a little long, so I look for ways to shorten it as I read. The Fantastic Undersea Life of Jacques Cousteau by Yaccarino. This is one of my favorite books about inventors! Great illustrations, nice quotes from Cousteau, and a engaging story that begins with him as a child and then moves through his life of inventing and discovering. Super Submarines by Mitton and Parker. I like their Amazing Machines series a lot, for ages 3 – 6. Nice rhyme and rhythm to the text, fun illustrations peopled with cute animals and bright colors, engaging non-fiction overviews of the theme. Some of the topics are a little over kids’ heads (like sonar, and when it says subs can be used to service oil rigs, which most little ones won’t know anything about) but the kids don’t seem to notice/mind. Submarines (How Things Work) by Mattern. I love how this starts: “Imagine spending months inside a ship with no windows… now imagine that ship is sailing underwater. Usually people want a ship to stay on top of the water! Submarines can dive down underwater. 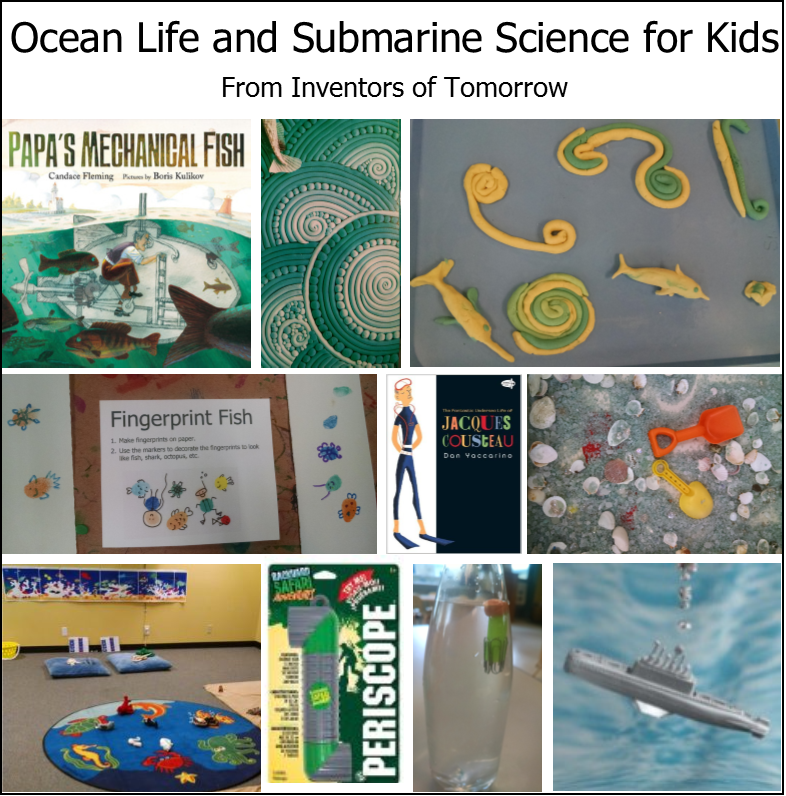 How do they sail beneath the waves?” This engages kids, raises a real question in their mind, and leaves them in a state of curiosity and inquiry – ripe for learning. Good, kid-friendly non-fiction overview of submarines, with good photos. It covers similar content to Super Submarines, though in a little more detail, and without the cute illustrations or rhyming. If you have a kid who likes their science books to feel a little more serious, this is a good match. Also includes a timeline of sub history, and directions for making a ballast sub similar to ours. 4 – 8 years. Submarines (My Favorite Machines) by Ruck. 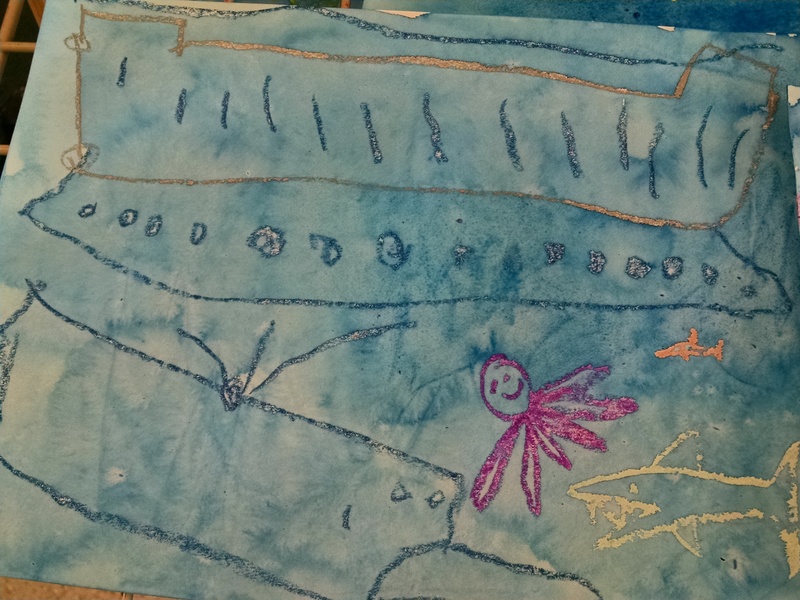 A fine non-fiction overview of subs, for ages 5 – 7. Like Bodden’s book (below), it has more emphasis on the weapons and military use than I like. If this doesn’t trouble you, it’s a fine option. Submarines (Built for Battle) by Valerie Bodden . I didn’t notice that series sub-title of “Built for Battle” before I checked this out. Although it’s a good overview of subs, it focuses on their use in war: “the control room has everything crew members need to steer the sub and fire its weapons… It can protect warships from enemies. Subs can fire torpedoes or missiles at enemy ships… and toward targets on land too.” It’s too militaristic / jingoistic for my taste, but may really appeal to some. (A review of another book in the series says the series got a reluctant 8 year old motivated to try reading.) Ages 6 – 8. Submarines UP CLOSE by Abramson. For ages 7 and up – and only kids who are really into machines. The text goes into a lot of detail about parts of the sub, there are lots of BIG photographs of subs – some modern, some dated some historical – but without captions that really explain what you’re seeing. Yellow Submarine.. the Beatles . I should have read the description better. I thought it was just an illustrated version of the song lyrics. But instead, it’s the full story of the film Yellow Submarine, and much longer than I wanted to read. Scuba Bunnies by Loomis and Eitan. For 3 – 5 year olds. Sweet little bedtime story about scuba diving bunnies. “Scuba bunnies long to see what’s beneath the deep blue sea. Kiss their mamas, check their gear, tanks are filled, masks are clear. Watches working, wet suits zipped. Snorkels on, flippers flipped.” And so on. I’m sure if you’re clever, you could find a way to make your Cartesian bottle divers look like Scuba bunnies. Maybe Shrinky dinks?? Scuba Diving by Teitelbaum. This was one of only two kids’ book on scuba diving my library had. It’s for older children, ages 7 and up, so it’s not something we read in class, but I did like it for the pictures. We put it on the table where we were building the diver bottle. Many of the kids hadn’t heard of scuba diving, so it was nice to be able to show them photos of divers both in and out of the water. Don’t miss the other post on recommended books about the ocean and fish, especially Over in the Ocean.